WILMORE, Ky. – When Dale Walker left his home in St. Elmo to become a student pastor at Cypress and a student at nearby Southern Illinois University in Carbondale, he didn’t know he would, with the help of his wife Alice, someday begin a seminary in Indonesia. In fact, he didn’t yet know the former Alice Chiarello. Neither of them knew that someday Alice would publish the first hymnal of indigenous hymns in Indonesia. He also didn’t know he would author the first concordance every in the major Indonesian language. Before heading for Indonesia, Dale spent three years at Drew University majoring in Biblical language. While there, he met and married a pretty red-haired girl from nearby Fairfield, N.J. When they first met, Alice was dating one of Dale’s friends. While studying at Drew, Dale spent two years at Trenton and a year at a Presbyterian church in West Orange, N.J. That experience opened Dale to interdenominational work in the coming years. Dale has been a member of the Illinois Great Rivers Conference and one of its predecessors, the Southern Illinois Conference since 1960. Upon his graduation from Drew in 1962, Dale and Alice were accepted for assignment by the General Board of Global Ministries. He spent the summer studying languages at the University of Oklahoma and in the fall, enrolled in the Ph.D. program at Cornell University. He finished that degree while serving in Indonesia. The 1963 trip from New York to Jakarta, the capital of Indonesia, took six weeks via freighter, but they had arrived in the country where they would spent most of their ministry. The first assignment Dale was give was rural evangelism. He and an Indonesian, Johnathan Napiun, a recent graduate of Trinity Theological College, an Indonesian school, were sent to establish rural churches on the south end of Jakarta to work with migrants from Java. Some of them were Christians, and Dale and Johnathan were assigned to find the Christians and encourage them to form churches. For four years, Dale and Johnathan climbed in the back of the truck each week for the all-day ride to their mission assignment, spent three or four days of evangelism and church planting. They started three churches, and those churches have since expanded to two dozen. That along would be a worthy ministry, but after their first furlough, Dale completed his Ph.D. and was assigned to an interdenominational seminary operated mainly by the Reformed Church. During those years, Alice was the typical faculty member’s wife, trying to mix with other ethnic groups and be a witness to them, most by her spirit and actions, but after awhile, she felt a need to do something more and decided God was calling her to compile a hymnal of indigenous Indonesian hymns. She and Dale worked with students and other Christians who were singing new hymns with original Indonesian melodies. They found a Filipino “musicologist” who figured out the notes and went to work. Alice still treasures her copies of that Indonesian language hymnal. Until then, the Indonesians were taught traditional Methodist hymn but had nothing to claim as their own. The idea of collecting indigenous Indonesian hymns caught on, and there are now several larger collections containing them which are being used throughout the country. However, it was Alice who pioneered the concept. By this time, the Walkers had five children – Rohani and Phil, born in Sumatra; Andrew and Brian, adopted from the city of Bandung, on Java; and Michelle, born in Jakarta. Rohani is now an Episcopal priest in Texas and Phil is serving as a missionary in Indonesia. 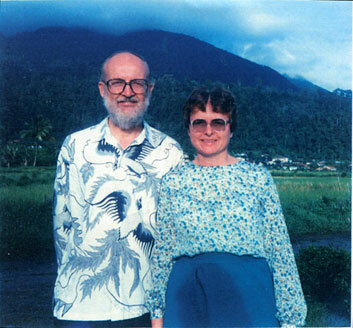 In 1982, Bishop Sitorus of the Indonesian Methodist Church asked Dale to move to North Sumatra in order to expand and upgrade a Bible School into a full-fledged seminary. This became ITA (Institut Teologia Alkitabiah) Biblical Seminary. When they arrived, the only building on the camp became the Walkers’ home. When the students arrived in 1983, Dale and Alice lived in temporary housing. The one substantial house then became the classroom, dining room, a girl’s dormitory and home for two other teachers. The school began with 15 students, 10 men and five women. The Walkers were joined by an Indonesian pastor, Pandu Bone and his wife, Inraini and the four of them formed the original faculty. 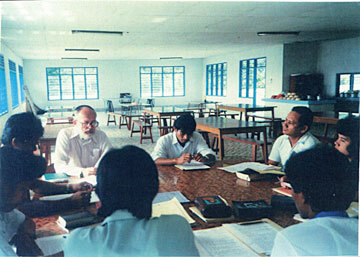 By 1988, 10 of the 15 students had graduated and the seminary had grown to around 100 students. One of the graduates was Darwis Manurung, now a bishop of the Indonesian Methodist Church. Though it was a Methodist school, Dale insisted on welcoming students of various group, and they eventually had students from 10 denominations and an equal number of ethnic groups enrolled. The current enrollment is approximately 200. In 1990, with the school firmly in Indonesian hands, it was time to move on. Before returning to the United States, Dale’s linguistic skills were again called into play. This time, it was Poland. Dale spent three years teaching at the Jan Laski Theological Seminary near Warsaw. Laski was a Polish follower of Erasmus in the 16th century. And what was the Methodist connection? Laski also worked together with Thomas Cramner in England in developing the Anglican prayer book, which in turn, greatly influenced the Wesleys. In the Jan Laski school, and in other Methodist schools, Dale taught English. The English schools made money and that money was used to educate theological students who came one week a month. Dale also wrote several articles (in Polish) for the national Methodist magazine. After his long career, the time to “come home” arrived and the Walkers returned to the United States. Dale served as pastor of Albion-Bethel (1995-98) and Windsor-Zion Hill (1998-2000). Dale says the biggest surprise upon returning to the United States was the secularization of our society. He is amazed at how little people speak of matters of faith in everyday life. For the past 10 years, Dale has been teaching Islam at Asbury Theological Seminary. And who, after all, would know more about Islam than Dale who spent so many productive years in Indonesia? Dale tells with pride that at least one student from every class has gone to live and work in the Middle East or the wider Muslim world. From St. Elmo to Cypress to Drew to Cornell to Sumatra to Jakarta to Warsaw to Illinois to Wilmore, Ky. It’s been a long, joyous and productive ministry. Thanks, Dale. Thanks, Alice.